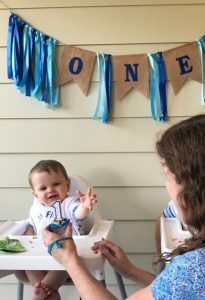 I had my oldest son’s first birthday party planned out for months. The theme was Brown Bear, his favorite book. I had a personalized T-shirt made, matching cupcake toppers ordered, invitations sent out to friends and extended family, the whole works. 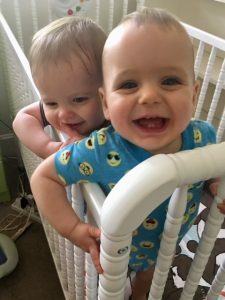 This time around, with my twins about to turn 1, I could not get motivated. October 6 was getting bigger on the calendar and I had no theme, no invitations and no idea what I was going to do. Low key was going to be my mantra, and that was OK. As a twin mom, I cut myself slack all the time. It’s just how we have to roll sometimes. And it’s not like the babies were going to remember this birthday anyway. And a first birthday is for the family, right? But even I had to admit to myself here lately: I was dropping the ball. 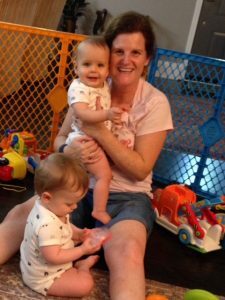 Deep down, in my most honest thoughts, I wondered if what was holding me back was that I just didn’t know my babies as well as I did Wade by this point. With him, a Brown Bear birthday theme was a slam dunk. I don’t spend the same amount of time with the twins that I did with Wade when it was just the two of us at home during the day. Now, my husband and I have a part-time nanny, preschool teachers, my mom and sister and a gaggle of friends who help us raise these boys. Luckily, before I could get so far into my own head that it was ridiculous, an idea for a party theme came to me. I was holding Wes at the time and he was wearing this aqua blue onesie with yellow emojis all over it. (Hey, sometimes mom brain means you need to be hit over the head with a 2 X 4!) My husband has been calling Johnny, Johnny Smiles since shortly after he was born. (I swear the boy came out smiling.) Once Wes got past his worried-look phase, Daddy started calling him Wesley Smiles too. 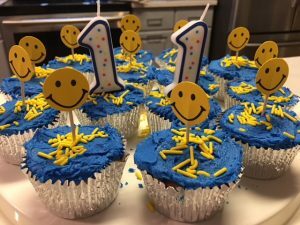 So their first birthday theme would be smiley faces! Not exactly trend-setting stuff, but it would be meaningful to us. I typed “birthday” and “smiley faces” into Etsy.com and found cupcake toppers to order. Whew. Then I promptly sat around on my rear end for the next two weeks. Well, not technically. We’ve been in the midst of a move (see previous blog.) I was doing well to find the cupcake toppers which arrived mid- chaos. But who wants to hear a bunch of excuses? Fast forward to three days before the twins’ birthday. I’m walking into a party store, looking to make up some ground. I’m wide-eyed as I hit the row with birthday party loot. For boys it’s all about Avengers and Transformers and Disney and all sorts of things I’m not even fathoming yet. I just wanted something with a “1” or a smiley face on it. I asked a sales lady for help and was told their first birthday decorations had been taken down in favor of Halloween décor. 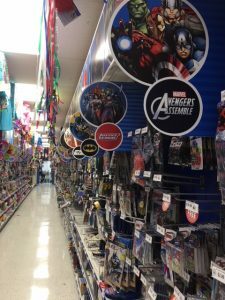 I could find first birthday decorations if I wanted to drive to another one of their locations across town. With the clock already ticking on mama time (Wade was in preschool and the twins at home with my mom) I drove home and got on Amazon.com instead. 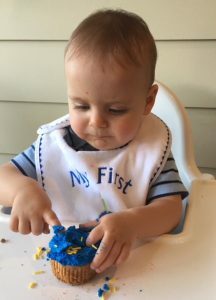 In a matter of minutes – and thanks to two-day shipping – I had birthday bibs, banners and matching plates, cups and napkins heading our way. Right about then, when I stopped worrying about it, the party started falling into place. My sister texted, saying she would get hamburgers and hotdogs to have for dinner by the pool. (She had offered to host at her house. The fact that she has a pool and that it’s still hot in October is win-win.) Family and friends I reached out to at the last minute all said they could come. We’ll be eating those hamburgers and hotdogs on paper plates. I’m making my own cupcakes (who needs to pay $3.50 for a cupcake with so much icing not even adults know where to bite) and I’ve asked people not to worry about gifts. If we’re not careful, “low key” might even turn out to be fun! I’m excited about Saturday! 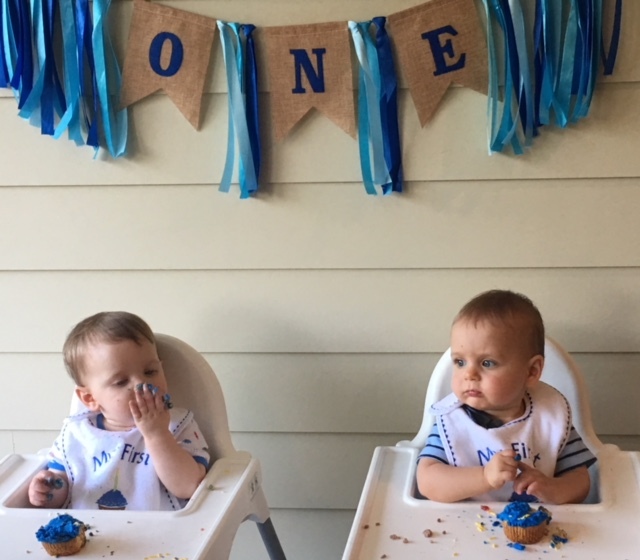 As for my insecurities about how well I know our twins as they approach their first birthdays, I decided to let that go too. No, I don’t get 1-on-1 time with them like I did Wade and it’s frustrating that I can’t always scoop them both up at the same time and love on them as easily as I could with Wade. But now that they’re a little bigger and stronger, I can pick them both up, at least for a little while. And I can hold one of them while I’m talking to another. I can read or sing to both of them at once. Without having to think, I can tell you that Johnny is good at clapping his hands and Wes at waving. That Johnny wants to hold every morsel of food he eats right now but Wes doesn’t mind if you spoon feed him still. Wes has got peek-a-boo mastered and loves to turn pages of a book. Johnny would rather just go, go, go, in part to keep up with his big brother, Wade, but every once in a while, in those special moments, he’ll let you hold him tight and just stay…right….there. 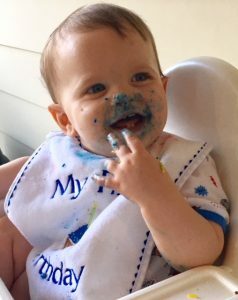 So yeah, no, the first birthday isn’t about the party, the cupcakes or a dreaded theme. It’s about celebrating the chance you’ve had to get to know these little buggers over the past year. As weird as it might sound, by becoming a mom for a second (and third) time, I’ve learned that it does take a while to get to know your baby. You don’t realize it when you have your first, but you do when you have something to compare it against. As beautiful as the birth moment is, the depth of a relationship comes from the time spent and memories made from that point on. Wade had a 20-month head start with my undivided attention. If Johnny and Wes have smiled so much over the past 12 months that it’s part of their nicknames, then we’ve got a lot to celebrate. And that’s all that really matters.